A storage set is the assignment of one or more user groups to a single StorageVault. 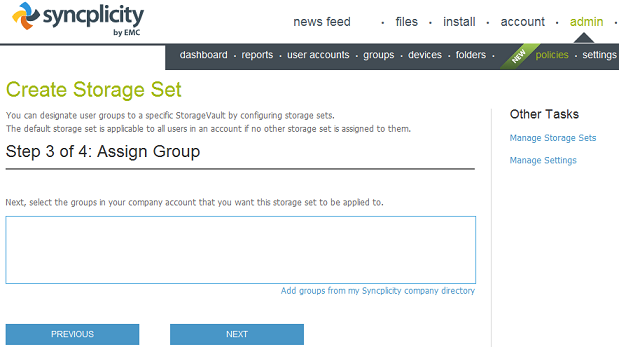 The Syncplicity account has one default storage set that is applicable to all users in the account if no other storage set is assigned to them. For information about StorageVaults, see the About Syncplicity StorageVaults and on-premise storage article. When you create a storage set, the selected StorageVault for the new storage set becomes the default StorageVault for the group that you specified. 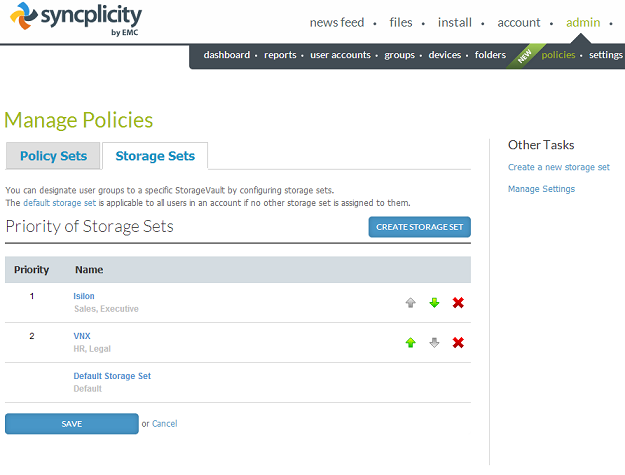 To open the Storage Sets page, go to the My Syncplicity web site from your browser and log in as an administrator. Select admin > policies and then click the Storage Sets tab. Name: Any name you choose to identify the storage set. It must be unique. StorageVault: The name of the StorageVault to be used by the user group. User Group: One or more user groups to associate with the storage set. Priority: The order of use should a user belong to multiple groups, where the groups may be assigned to different StorageVaults. You select the priority by clicking the up or down arrow. Important: Should you delete a storage set or modify its priority, it can affect the storage and quota of a large number of users. When you make any changes, including changing the priority, you must click Save to implement the change. To edit a storage set, click on its name. Click Create Storage Set in the Storage Sets tab. Type the name of the storage set. Storage set names must be unique. For example, you can type Storage-Isilon-East. Modify the StorageVault in the storage set by selecting a StorageVault from the dropdown menu. By default, the StorageVault in the default storage set is selected, and it represents the default StorageVault of the company. Assign one or more user groups to the storage set. Optionally, you can create a storage set without adding groups then add the groups later. 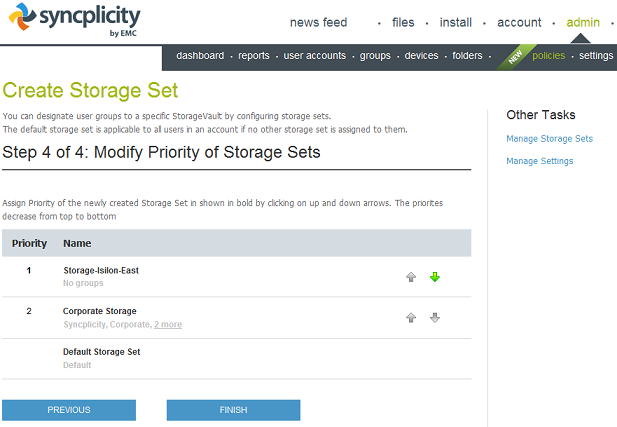 Click the up/down arrow to assign the correct priority to the new storage set. You can only modify the priority of the new set.